Somehow I missed that with Green Arrow, we said goodbye to Carlos Pacheo's run as designer of the Heroes of the DC Universe Mini-Bust series from DC Direct. Perhaps, like most of Pacheo's characters, I had my eyes closed. 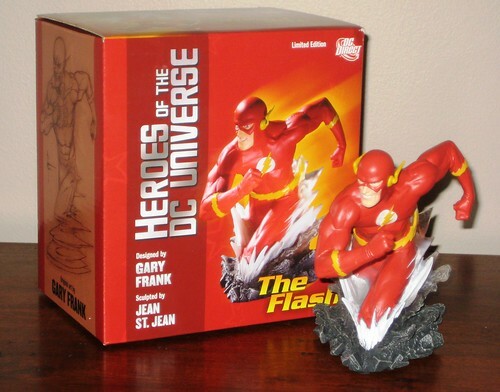 Anyhoo, it's Gary Frank's turn, and first up is the Scarlet Speedster himself, The Flash. Frank has a very distinctive artistic style, and the truth of his sketch is captured very well in the sculpt overall, although the jaw is more square in the final product than the angular version in Frank's design. The other question I have is whether or not the arms are actually a bit long, as the left elbow seems exaggerated, but it's hard to tell without being able to extend it. 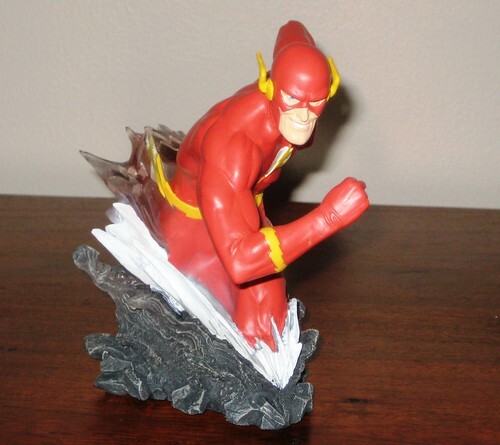 Paintwork is rock solid, and the base here is dynamic, fun and make sense, and all this makes Flash a great addition to the line. This has been a fun series to collect - I've made a budgetary decision to collect the Heroes only at this stage and not the Villains counterpart line. What I'm really waiting for, though, is for this line to start delving beyond the A-List and deliver a few of the lesser known or oddball choices that we've seen in the Women's Mini-Bust line. Time will tell if this line lives that long. Another great looking bust. I see what your saying about the slightly long arms as the right arm looks a little hyper-extended but maybe it is just the Flash being his lanky self?? I like it, and the long arms just adds character. I checked with Rob Liefeld about the anatomic correctness and his words were "dunno what that is, but this guy needs more muscles, coupla guns, and a truck load of pouches. Nice job avoiding drawing the feet." Yeah, it will be nice to see what choices they turn to once the Alist dries up. Nice! I like these busts, and since I finally started getting into the Women of DC busts, I'm more tempted by these. Also, Westy should win the Comment of the Month Contest. Doesn't really scream "bust" to me, probably due to him having a waist and thigh. Busts seem to be getting bigger. But I like this one. Though I won't get them and live vicariously through you Andy. I really like the dynamic posse and the base. Flash is a really hard character to do, but a great one when it's done right. Congrats on the new bust. Just ordered it! Let's wait now. It seems to be good.